What is milia and how does it form? It is not uncommon to see milia in aesthetic clinics as, nowadays, patients are frequently seeking skin rejuvenation treatments and may be conscious of this condition. Often, patients will have tried to treat their milia like regular breakouts but quickly learn that it isn’t as easily resolved. In this article, I discuss the typical clinical presentations and how to treat and prevent milia. 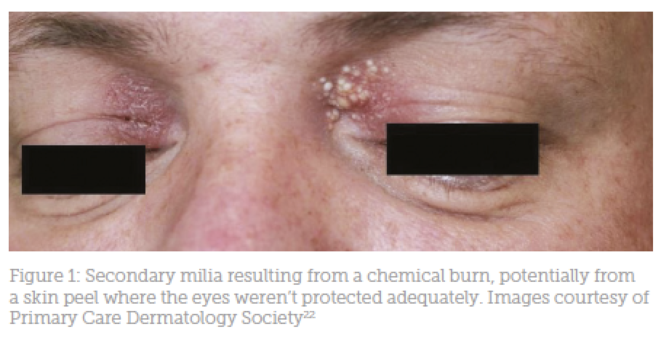 These plaques can develop following trauma to the skin, for example, after a burn, in a blistering disorder such as epidermolysis bullosa, following a resurfacing skin treatment and even after tattooing.7,8 Secondary milia has also been described following potent topical corticosteroid use.9 These are all thought to be a result from damage to the pilosebaceous unit. 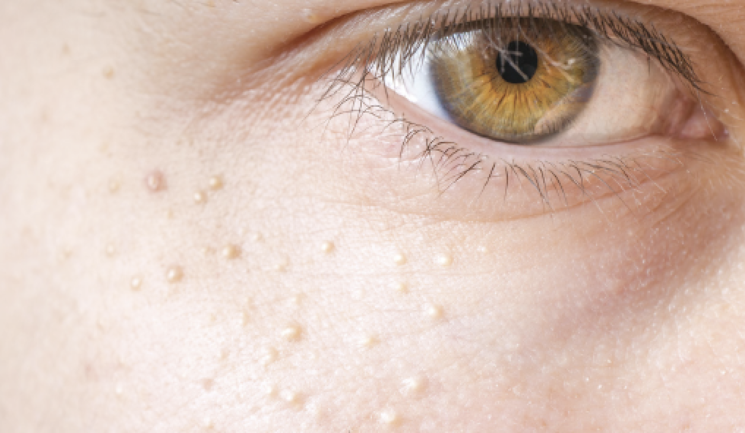 Although milia is harmless and treatment is not necessary, when the milia does not resolve itself (as it often does in babies) there are a few treatment options for adults to consider, which are now commonly being offered within aesthetic clinics. Deroofing is the most commonly-utilised technique where a sterile needle pierces the skin, then the milia is taken out with the blade of the needle. The milia can often be scooped out whole, as it is quite firm in texture. For a successful outcome, it is important to ensure the whole milium is removed. This procedure is fast and has minimal risks if an aseptic technique is followed. It typically leaves the patient with a small graze where the milia was, which should heal quickly. Hyfrecation can be used to shatter and dehydrate the cyst.18 With this treatment option, a fine tip needle is used which delivers either an electric current or radiofrequency. This is usually only available in clinics where there is a dermatologist working within the team. When choosing an appropriate treatment method, it is vital to be confident and competent with the procedure and its associated risks and outcomes. Milia is often located near the eyes, which makes it a high-risk region to work on. It is important that you have a steady hand and your patient is reassured and unlikely to jump. Clearly detailing what is to come in your consultation process should help to prevent this. As with most treatments that compromise the skin, infection, bleeding and swelling are all potential risks. Scarring needs to be discussed thoroughly during the consultation process as some patients may prefer to keep the milia, rather than gain a possible scar. The treatment options mentioned will cause discomfort and others may require local anaesthetic, (for the treatment of hyfrecation, for example) which then carries risks of allergic reactions. None of the procedures can guarantee that the milia will be completely removed, although a good result is commonplace. It is also important to manage patients’ expectations as milia can return. As milia can return, retinols (under guidance) and gentle skin peels are recommended to keep the skin soft and encourage cell renewal, if suitable for the patient’s skin-type and lifestyle.23 It is also good practice to remind patients to avoid skin products which contain mineral oils and lanolin to prevent the chances of reoccurrence. 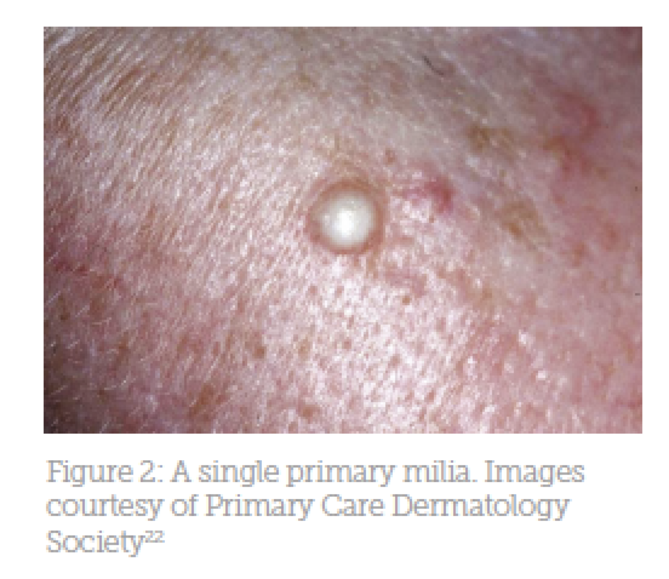 Primary milia is completely harmless and very common. In our current times, our patients are more-often-than-not striving for immaculate unblemished skin, so the desire for milia to be removed is on the increase and having the skill to do so is a great asset to any practice. Kurokawa I, Kakuno A, Tsubura A. Milia may originate from the outermost layers of the hair bulge of the outer root sheath: A case report. Oncol Lett. 2016 Dec. 12 (6):5190-5192. Garcia Sanchez MS, Gomez Centeno P, Rosen E, Sanchez-Aguilar D, Fernandez-Redondo V, Toribio J. Milia en plaque in a bilateral submandibular distribution. Clin Exp Dermatol. 1998 Sep. 23(5):227-9. Castelvetere M. Milia en plaque. J Eur Acad Dermatol Venereol. 1999 Mar. 12(2):195-6. Ratnavel RC, Handfield-Jones SE, Norris PG. Milia restricted to the eyelids. Clin Exp Dermatol. 1995 Mar. 20(2):153-4. Charles M G Archer, MBBS, MRCP(UK) Milia Clinical Presentation. Updated: Mar 10, 2017 https://emedicine.medscape.com/article/1058063-clinical#b3 [accessed 16.01.19]. Calabrese P, Pellicano R, Lomuto M, Castelvetere M. Milia en plaque. J Eur Acad Dermatol Venereol. 1999 Mar. 12(2):195-6. Miller LM, Schwartz JT, Cho S. Milia: a unique reaction to tattoos. Cutis. 2011 Apr. 87(4):195-6. 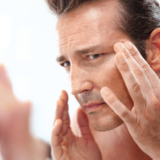 Connelly T. Eruptive milia and rapid response to topical tretinoin. Arch Dermatol. 2008 Jun. 144(6):816-7. Langley RG, Walsh NM, Ross JB. Multiple eruptive milia: report of a case, review of the literature, and a classification. J Am Acad Dermatol. 1997 Aug. 37(2 Pt 2):353-6. Multiple eruptive milia in a 9-year-old boy. Diba VC, Handfield-Jones S, Rytina E, Hall P, Burrows N Pediatr Dermatol. 2008 Jul-Aug; 25(4):474-6. Rutter KJ, Judge MR. Profuse congenital milia in a family. Pediatr Dermatol. 2009 Jan-Feb. 26(1):62-4. Heard MG, Horton WH, Hambrick GW Jr. The familial occurrence of multiple eruptive milia. Birth Defects Orig Artic Ser. 1971 Jun. 7(8):333-7. George DE, Wasko CA, Hsu S. Surgical pearl: evacuation of milia with a paper clip. J Am Acad Dermatol. 2006 Feb. 54(2):326. Sandhu K, Gupta S, Handa S. CO2 laser therapy for Milia en plaque. J Dermatolog Treat. 2003 Dec. 14(4):253-5. Noto G, Dawber R. Milia en plaque: treatment with open spray cryosurgery. Acta Derm Venereol. 2001 Oct-Nov. 81(5):370-1.